Infor CRM - Formerly SalesLogix - What is it and What Does it Cost? Infor CRM, formerly known as SalesLogix is a market leading CRM system that allows organisations to deliver amazing customer experiences and business growth through advanced sales force automation and marketing. Infor CRM offers a comprehensive range of features and resources for companies to deliver superior service and support whilst increasing customer loyalty and lifetime value. What Are the Benefits of Infor CRM? By centralising all customer data in one place Infor allows users and teams in your business to track and organise all interactions, allowing you to share key information throughout the company and perform detailed analysis of the data. Superior Contact Management – Every phone call, meeting, document, email, and touch point with customers and prospects is tracked and made accessible to the whole business. This helps boost the efficiency and productivity of sales, customer service, and marketing teams. Sales Team Management – Infor CRM equips sales managers with a 360-degree view of all sales activities, lead management, and opportunity pipelines so they can measure sales Vs targets. Reliable and Accurate Sales Forecasting – Customer Relationship Management Software allows you to understand past and current trends in sales so you can forecast and project future sales. Improved Customer Retention and Loyalty – Many customers get annoyed when they are passed around by various departments. Infor CRM provides all information to customer service reps which helps build better relationships and reduces client attrition. Discover New Business Insights with Reliable Reporting – Report on every aspect of customer interaction that will provide a valuable insight into your performance. 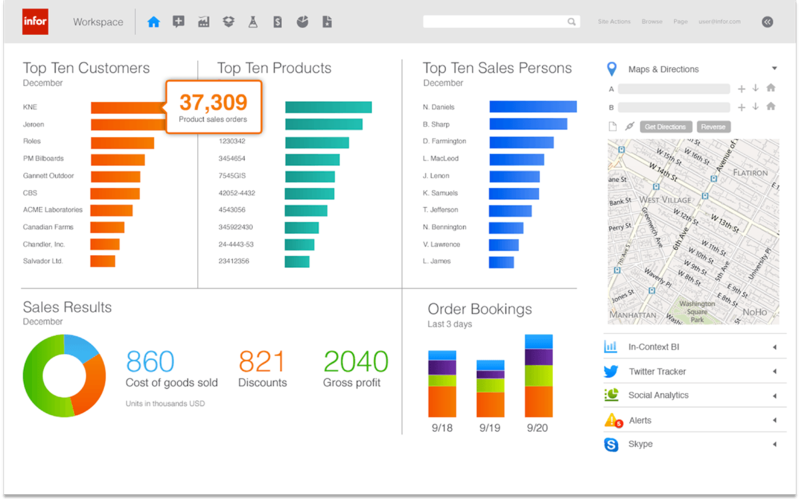 Infor CRM also has advanced analytics and dashboards so you can track key KPI’s. 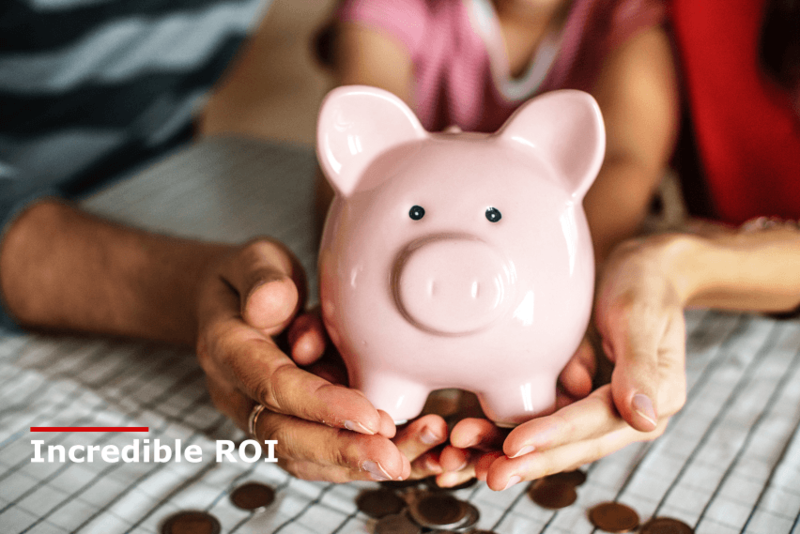 Generate Leads and Increase your Marketing ROI – The marketing module in Infor CRM allows you to generate more leads for sales and increase the return on investment on your campaigns. Improve Collaboration – The system allows your teams to collaborate more effectively regarding customers and prospects. More Sales – Cross selling and up selling opportunities are created generating more revenue for your business. What are the different modules in Infor CRM? Running a successful business requires you to manage all aspects of customer and prospect interaction. Having the right tools to manage sales, marketing, customer service, and support will greatly improve your business processes and customer retention. There are five main modules in Infor CRM and here we detail what you can find under the bonnet for sales, CPQ, customer service, support, and marketing modules. Sales Module – Gives your sales teams the power to exceed sales targets and close deals. Key features include opportunity management, pipeline optimisation, quotes, order management, and contact management. Customer Service – Enables staff to quickly respond to issues; resolve support tickets, product issues, and manage your support team. Marketing – The marketing module allows you to generate leads. Includes key features such as campaign management, segment lists, and marketing reports. CPQ (Configure Price Quote) – Allows you to quickly organise quotes and prices for complex products. Support Module – Manage support tickets, contracts, product returns, RMA’s and product serial numbers. Analytics and Reporting – This module allows you to run reports and create dashboards enabling you to track KPI’s and analyse all your data. What are the Deployment Options for Infor CRM? You can deploy Infor CRM for on-premise, online via the cloud, or as a hybrid installation (a mixture of cloud and on-premise). These deployment options give the customer the choice of the best environment to manage their data. On-Premise - This allows organisations to purchase the software and install CRM on their own servers, users can access customer data from PCs and laptops. It also allows for access via the web and mobile devices. Cloud – Hosting your data in the Cloud is becoming the most popular choice for many companies. It offers more affordable plans as Infor can be paid for on a monthly subscription pricing plan. Hybrid (both On-premise and in the Cloud) – If you have a mixture of office based staff, remote offices, remote users, or staff wanting to access via a web client, as well as mobile users, a hybrid deployment can offer the best of both worlds. What is the Difference between Infor CRM and SalesLogix? Basically, Infor CRM and SalesLogix are the same product, as Infor acquired SalesLogix from Sage back in 2014. Infor retained all the original SalesLogix features but have continued to develop the software by investing loads of money and resources, making it a much more solid platform. There are still plenty of SalesLogix sites in use that will no doubt be upgrading to Infor CRM to take advantage of the improvements. The product has been extensively developed, with the focus on more flexibility, better options for mobile CRM, improved integration with ERP and a focus on industry-specific solutions. Infor is also developing the product to be one of the best Cloud based solutions in the marketplace. Improvements in the new system include. Better integration with the most popular apps, such as Outlook and Office 365. Loads of new features to enhance user productivity. A big emphasis on improving Cloud functionality. A comprehensive range of flexible deployment options – on-premise, cloud, and hybrid. Does Infor CRM Integrate with ERP and Accounts Systems? If you want to remove data silos in your business and improve productivity and processes, then integrating your CRM data with your ERP and Accounts data will radically improve your organisation's efficiency. 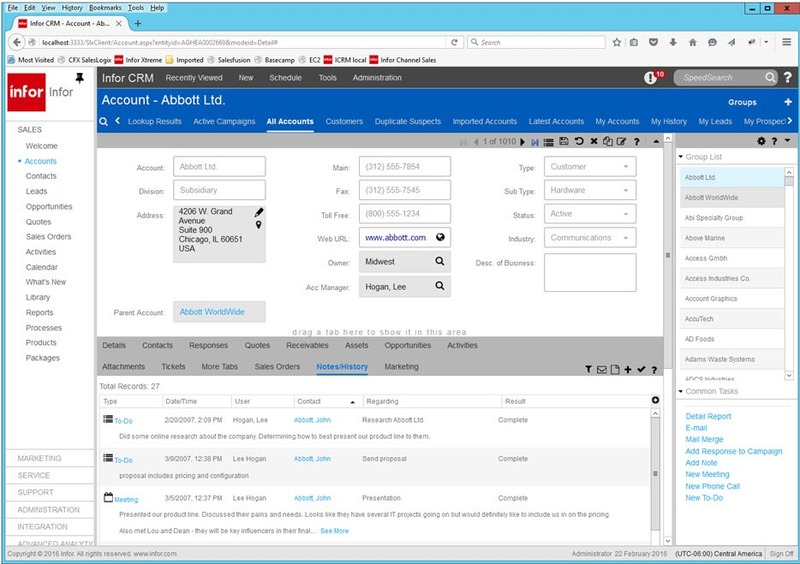 Infor integrates with several major accounting and ERP solutions including the Infor ERP products, it also integrates well with Sage accounts, such as Sage 200. 360-degree view of Customers. Get a complete view of all interactions with your customers, including orders, invoices, transactions, phone calls, meetings, documents, and to-do’s. Easier Access to Key Information. 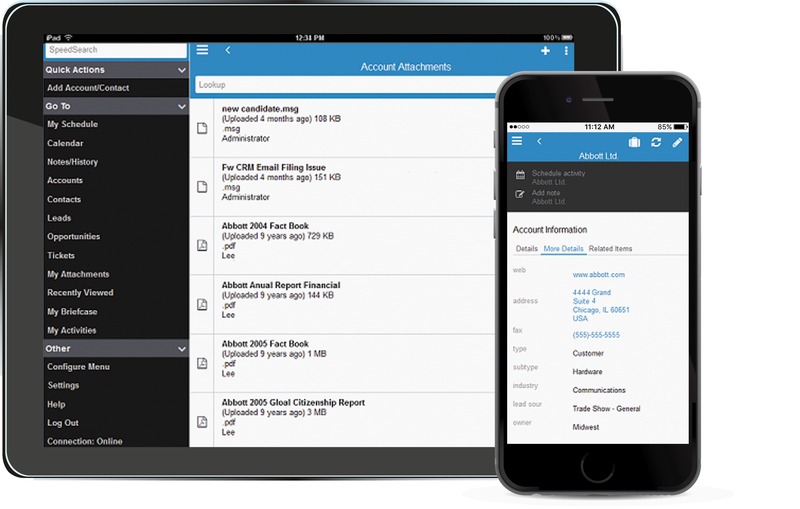 Access key information such as balances and transactions. Both Front office staff, such as Sales, and Back office staff, such as accounts, can see key information from other departments. Streamlined Business Processes. Improved business processes will speed up the business, an example would be: salespeople can take orders from customers whilst remote, this would then be integrated with accounts for quick delivery. How Much Does Infor CRM (SalesLogix) Cost? The pricing from Infor does change regularly so the below costs are a just a rough guide. If you want to know more about the costs, check out our Infor Cost Page here. AlphaLogix provides a range of services and training for Infor CRM. This pricing module allows you to buy the licenses for to use on your own server, it is commonly referred to as a perpetual license plan and the cost is based on the number of users you want. There are two types of user licenses you can buy, the named user license costs £782 per user, and the concurrent user license is £1425 per user. There is also an annual maintenance fee of around 25% per year. Infor CRM Cloud Cost (SaaS). Infor offers a hosted SaaS subscription pricing plan which allows companies to pay a monthly fee for each user for a minimum of a 1-year contract. A named user for Infor CRM in the cloud is £579 per year (or around £48 per user per month), whilst a concurrent user is £891 per annum or £74 per month. There is no annual maintenance fee with the hosted option.